Until I opened Susan Follett’s novel, I had never heard of a fog machine. In the 1950s, apparently, they were widely used, particularly in the Deep South, to kill mosquitos. A specially fitted truck drove through town spewing clouds of insecticide, and the local children chased the trucks, weaving in and out of the clouds of sweet-smelling poison, heedless of the danger. As Susan Follett notes in her interview for New Books in Historical Fiction, this image of carelessly self-destructive innocents lured by something that only appears to be harmless is a perfect image for the deadly effects of prejudice—both for those discriminated against and, less obviously, for those who discriminate. This deeply thoughtful novel about what causes societies to accept and to resist change has a perhaps unanticipated resonance in the wake of the racial unrest that has afflicted the United States this past year. But it addresses the beginnings of the Civil Rights movement of the 1960s, now half a century old but neither finished nor forgotten. Through the lives of its three main characters and their friends and families, the book explores the segregated South, the in some ways no less segregated North, and the efforts—most notably during the Freedom Summer of 1964—to guarantee liberty and justice for every citizen of the United States of America. The rest of this post is from New Books in Historical Fiction. Even without the almost daily headlines reporting racial injustice in Ferguson, New York City, Cleveland, Madison, and elsewhere, it would be difficult to grasp that fifty years have already passed since the March from Selma to Montgomery to protest discrimination against African-Americans. Events that take place in our own lifetimes or the lifetimes of someone we know do not seem like history, and recent Supreme Court decisions combined with the incidents that populate those headlines raise questions about the stability of the gains made during the Civil Rights Movement as well as the long path that the United States has yet to travel before it achieves its dream of equality for all. 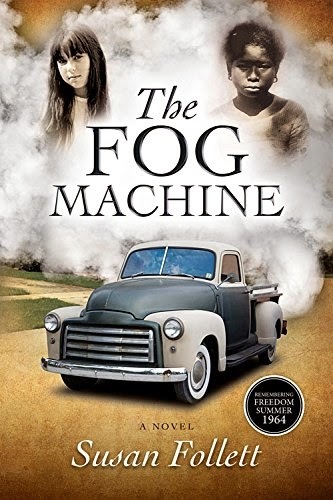 In The Fog Machine (Lucky Sky Press, 2014), Susan Follett recreates the years before the March from Selma, before the Civil Rights Act of 1964 and the Voting Rights Act of 1965. Her book begins in the Deep South, still clinging to its Jim Crow laws, then moves to the Midwest in an exploration of prejudice both overt and covert and of the forces that promote change in individuals and in societies. The novel opens with Joan, a seven-year-old white girl in Mississippi desperate to fit in. Part of fitting in involves humiliating C. J., who cleans Joan’s family’s house and babysits once a week. When C. J. then leaves for Chicago, Joan is devastated. Surely her cruelty must be to blame. But C. J. has her own reasons for leaving. Chicago welcomes her even as it confines her in a box labeled “live-in maid.” C. J. can’t imagine protesting this treatment; her parents have convinced her that safety means keeping her place. But as the 1950s give way to the 1960s, her friends from home question the wisdom of accepting the status quo. A man named Martin Luther King, Jr., is preaching civil disobedience. A boy named Zach is urging C. J. to help him change the world. And when Zach decides to take part in the Freedom Summer of 1964, C. J., too, wonders whether safety is the only thing that counts. Two weeks ago today, the Harvard historian Edward L. Keenan died. Ned—as he was known to his family, friends, colleagues, and students—was almost eighty, and most readers of this blog will never have heard of him, but for those of us who specialize in Muscovite history, Ned was a major figure in the field. Even historians of Russia who did not have the opportunity to meet him, let alone study with him, knew his name. As Gregory Afinogenov states in his memorial, “Breaking Muscovy’s Silence”: “When Keenan began his blistering career of skepticism and historical heresy in 1971, only two grand narratives existed in the West to explain Russia’s history to students, policymakers, and experts from other fields.” Ned created a third. Afinogenov lays out the details of all three with admirable aplomb, so there is no need for me to repeat them here. But I will reiterate his conclusion that all of us owe Ned a great debt for stirring up the long-dead bones of Muscovy and wiring them together into a new, more intellectually satisfying skeleton. Ned, you see, was the great gadfly of the field, a self-proclaimed radical skeptic who forced every source to produce its papers and probed the genetic heritage of sacred cows, throwing everything we thought we knew into chaos. In print he could be scathing about the intellectual flaws of his predecessors, but in person Ned was charming and supportive, an amusing raconteur with a phenomenal memory and a grasp of languages that left the rest of us in the dust. He adopted me the year I arrived in Boston, a grad student not yet thirty and fresh from archival research in what was then the Soviet Union, guiding my dissertation and finding a way to get me access to Widener Library at Harvard, where I roamed open stacks filled with the dusty aroma of books, armed with a straight ruler to cut the pages of 150-year-old tomes that no one before me had seen. I couldn’t have finished my doctorate without him. At the time, he presided over a lunch/study group of historians who specialized in medieval Russia (Harvard must be one of the few places in the world where you can scare up enough pre-Petrine scholars to form a study group). I thought of him as elderly because he had gray hair, but I later realized he must have been in his mid-forties when I met him. While one local or visiting historian after another laid out his or her ideas, Ned held court, pointing out questions the speakers had failed to ask and subjecting their arguments to insightful, unsettling comments. Years later, when I went to see him in his office at Dumbarton Oaks, his breadth of knowledge remained impressive, although by then he occasionally missed a reference or a source. When I heard he had retired to Deer Isle, one of Maine’s most beautiful spots, I was saddened but not surprised. When I heard he no longer had the energy to argue, I knew to expect the end. So, as the Orthodox say, “May his memory be eternal.” And life to us, who remain behind. Our field is richer, our appreciation of the need to distrust received wisdom greater, and our understanding of the past more complex because he moved among us asking questions. For a scholar, there can be no more fitting tribute than that. 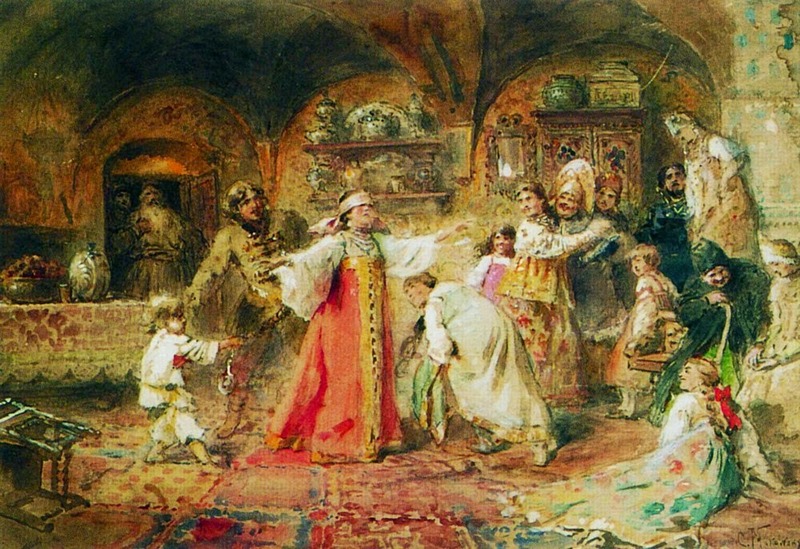 Image: Konstantin Makovsky, Blind Man’s Buff (1890s), via Wikimedia Commons. This image is in the public domain in the United States because of its age. As you know from last week’s post, I moved my author website from Google Apps, where it has lived since its inception, to Wix.com. At the time I posted, I expected it to take me much longer than it did to migrate the site address to the Wix servers after clicking on the button that said “Publish.” For this unlooked-for simplicity, I have Google to thank—although, as is not uncommon with Google, finding the right button to click required far more raw luck than one would expect from a site that markets itself as user-friendly. Still, I didn’t, in the end, have to deal with logging in to GoDaddy, where I don’t actually have an account except through Google, a detail that has caused me endless angst every time I’ve had to modify the directional settings for the site. Oddly, Google still threw up a user ID and temporary password for GoDaddy (that’s where finding the right button became a challenge) before I discovered the magic link that switched me to my own Dashboard and let me type in the server numbers provided by Wix. The same Wix that had promised to handle the connection for me if I could only provide my GoDaddy ID and password, which GoDaddy then refused to recognize.... This is why I will never give up the humanities for a life in tech. Most important, I love the professional look of the new site. Visiting it makes me happy. 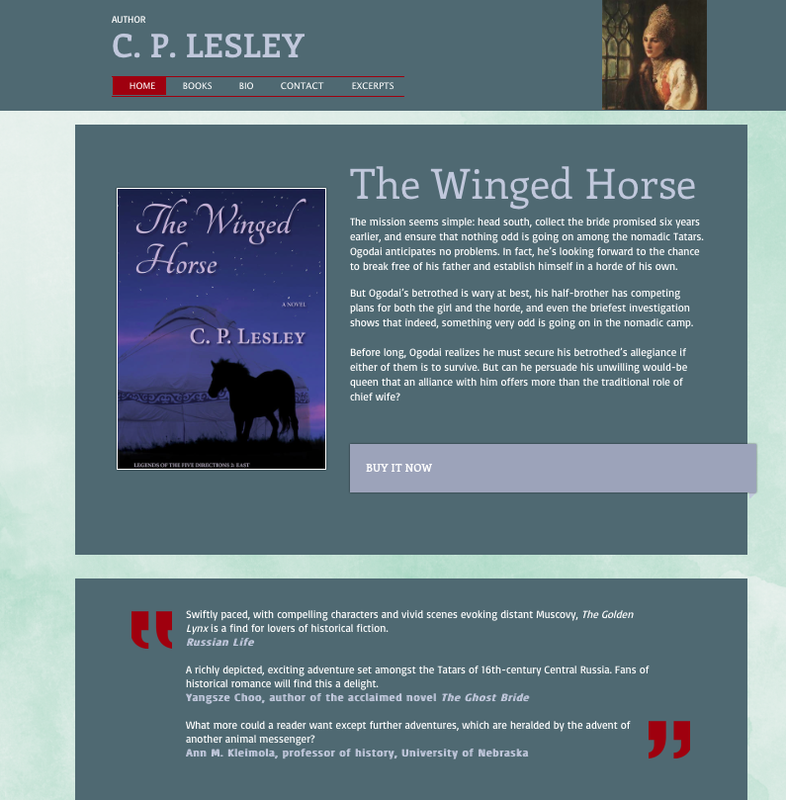 You can visit it, too, at http://www.cplesley.com, and I hope you will. I have even figured out how to add an iTunes button so that people can subscribe to my New Books in Historical Fiction podcast directly from my site. All that happened last weekend. More good news followed. On Tuesday, I learned that The Winged Horse had made the first cut for the M.M. Bennetts Award for Historical Fiction. If you’re interested, you can find out more about the award at the committee’s website, including a list of the semifinalists. This is the first time I’ve entered any of my books in a contest, so being selected feels like a real validation. The short list will be announced in mid-April, but I am already delighted. M.M. Bennetts, a specialist in early nineteenth-century British history, wrote novels set during the Napoleonic Wars and was highly regarded for the quality of her writing before her tragic early death in August 2014. The committee seeks to commemorate her by selecting for compelling, well-told stories. I feel honored to be included in the list of twelve. Perhaps best of all, I am finally through with the many tasks that have kept me away from Legends 3 for almost three months. This weekend—tomorrow!—I reenter my time machine, bound for the Russian North in 1536 and the world I have abandoned so long while still (half-)created. Are those swans I hear flying overhead?